______________________________________________________________________ All rights reserved. No part of this publication may be reproduced, stored in a retrieval system, or transmitted in any form or by any means, electronic, mechanical, photocopying, recording or otherwise, without either the prior written permission of the publisher or a license permitting restricted copying in the United Kingdom issued by the Copyright Licensing Agency Ltd, Saffron House, 6â&#x20AC;&#x201C;10 Kirby Street, London EC1N 8TS. All trademarks used herein are the property of their respective owners. The use of any trademark in this text does not vest in the author or publisher any trademark ownership rights in such trademarks, nor does the use of such trademarks imply any affiliation with or endorsement of this book by such owners. Chapter 1 Test Items 1. After reviewing the literature the qualitative researcher will select participants. The participants in a qualitative study differ from those in a quantitative study in that a. the number of participants are usually larger in qualitative studies. b. the participants are purposefully selected. c. the participants provide no personally identifiable information. d. the time commitment for participants is generally shorter. The first step of the scientific method is to a. recognize and define a problem. b. describe and execute research procedures. c. analyze the collected data. d. formulate hypotheses. Developing generalizations from a limited number of related observations or experiences is referred to as a. deductive reasoning. b. inductive reasoning. c. scientific method. d. reliance on tradition. Which of the following is indicative of most survey research? a. This method relies on controlling independent variables. b. This method relies on internal and external criticism. c. This method relies on tests and questionnaires. d. This method relies on interviews and observations. Narrative is a method employed by a. quantitative researchers. b. qualitative researchers. c. experimental researchers. d. empirical researchers. Case Study is a method employed by a. quantitative researchers. b. qualitative researchers. c. experimental researchers. d. empirical researchers. Which of the following is an example of a causal-comparative question? a. Are there gender differences in the effectiveness of computer-based simulations? b. Is there a relationship between computer based simulation training and attitudes about computers? c. What happens in a typical science lesson that includes computer based simulations? d. What are the reasons a school would include computer-based simulations in their instructional materials? Which of the following is an example of a correlational study? a. What are the attitudes of the parents about our districts new homework policy? b. Is there a relationship between student achievement and homework completion? c. Are there differences in parent attitudes about homework between mothers and fathers? d. How much homework does the average fifth grade teacher in our district assign? 12. Karen is a school principal. She has been collecting data all year regarding the benefits and costs of an after-school community service program. She thinks the program is effective but must make a decision about whether or not the outcomes of the program for the children justify the cost. She collects data from the students, parents, and those that have benefited from the program to assist in making her decision. Karen is engaging in which type of research? a. Evaluation b. Experimental c. Correlational d. Causal comparative 13. A publishing company is interested in determining if there is a need for a new reading curriculum. The research they will conduct is best categorized as a. experimental research. b. correlational research. c. action research. d. research and development. theory about how toxins affect these materials. Of the following, Paula’s research could best be described as a. basic. b. correlational. c. ethnography. d. applied. 16. Michele is interested in the effects on learning outcomes of questions within instructional materials delivered to learners via the web. She randomly assigns students to groups given either materials with questions or materials with no questions and assesses the effects of the questions based upon student performance on multiple-choice questions administered after learning. Of the following, Michele’s research could best be described as a. survey. b. correlational. c. experimental. d. narrative. 17. Chris is interested in the role of attitudes about weight training. He developed a questionnaire and sent it out to a sample of 30-59 year old males and females. Of the following, Chris’s attitude study could best be described as ____________ research. a. survey b. correlational c. experimental d. narrative 18. Kai is a qualitative researcher. The topic of his study is the homework strategies used by middle school children in an after-school homework club. He has reviewed the literature on both homework strategies and after-school programs and he has selected five children to study over the next 3 months. Of the following, which is most likely the next step in Kai’s study? a. Random assignment of participants to condition b. Reporting his results c. Collecting data d. Conducting statistical analyses 19. Katelin is interested in examining the relationship between years of gymnastics classes taken as a child and osteoporosis as an adult. She is concerned only with females because more girls take gymnastics than do boys and more women have osteoporosis than do men. Katelin addressing this concern and then developing research questions and hypotheses involves which step of the research process? a. Selection and definition of a problem b. Execution of procedures c. Analysis of data d. Drawing and stating conclusions 20. Basic researchers collect data primarily to a. determine methods for practical problems. b. make decisions about programs. c. develop theories. d. develop educational ‘best practices’. Which of the following examples illustrates reliance on deductive reasoning? a. Paul believes a vaccine works because his doctor says that it does. b. Bill concludes that his car uses unleaded fuel because it is an Escape and all Escapes use unleaded fuel. c. Juan assumes that black holes exist because scientists have told him that they do. d. Jack concludes that all mammals have fur based upon observing his cat and dog. Which of the following research questions is most consistent with a correlational study? a. Is there a relationship between amount of silent independent reading time allocated in a classroom and reading standardized test scores? b. What are the characteristics of a typical classroom’s silent independent reading session? c. Are there grade level differences in the effectiveness of independent silent reading? d. How many minutes is the typical independent silent reading session? Which of the following research questions is most consistent witha survey study? a. What are the behaviors users display while they play violent video games? b. Is there a relationship between violent video game use and aggressive behavior in school? c. How many hours per week does the average 6th grader play video games? d. Are there gender differences in types of violent behavior of children who play video games? The main purpose of research and development efforts in education is to a. contribute to science. b. formulate theory. c. develop products. d. make educational decisions. 27. Marge is conducting a study that addresses the effects of a funded program that recently concluded. Marge is likely conducting a. basic research. b. experimental research. c. formative evaluation. d. summative evaluation. 28. Dean is a quantitative researcher who studies attitudes about computer use. Which of the following data collection strategies is most consistent with a quantitative research design? a. Observe a few participants over an extended period of time as they work on computers. b. Conduct focus group interviews to determine computer usersâ&#x20AC;&#x2122; attitudes. c. Interview a few participants and ask them to refer others to the study. d. Develop and administer a Likert-type survey to collect attitude data. 29. Of the following which is likely a statement made by a qualitative researcher in a study that addresses social skills training. a. I would like to interview a few of the participants to understand their training. b. I would like to give participants a test to determine their skill level. c. I would like to use teacher ratings to see if the program worked. d. I would like to control which students get the training so we can compare groups of children that did and did not get training. Correlational research is concerned with a. differences between conditions. b. examining relationships among variables. c. describing the preferences of some group of people. d. controlling treatment conditions for appropriate comparison. Action research is used to a. find and solve educatorsâ&#x20AC;&#x2122; problems. b. control independent variables. c. promote generalization of research findings. d. examine historical educational trends. 32. Roger is a narrative researcher who studies the steeltown communities of the 1950s. Of the following which is a data source Roger will likely use in his work? a. A new book on the subject b. A recording of a journalistâ&#x20AC;&#x2122;s visit c. A newspaper story written overseas d. An interview with longtime residents 33. Which of the following illustrates Aaron, a qualitative researcher, collecting data for an ethnographic study on alternative schooling. a. Aaron sends out surveys to directors of alternative schools. b. Aaron examines achievement measures of students enrolled in alternative schools. c. Aaron invites students from alternative schools to visit him and conducts interviews. d. Aaron goes to an alternative school and volunteers on the staff. 34. Experimental research differs from causal-comparative research in that a. causal-comparative research is interested in statistical relationships between variables and experimental research is not. b. experimental research relies on data collection from multiple pools of participants while causal comparative research relies on participants from a single pool. c. experimental research controls the dependent variable in the study and causalcomparative does not. d. experimental research controls the selection of participants from a single pool and divides them into groups while causal-comparative research does not. Evaluation researchers collect data primarily to a. determine methods for practical problems. b. make decisions about programs. c. develop theories. d. develop educational ‘best practices’. 40. In a causal-comparative study that examines differences in psychomotor skills between young, suburban, middle-class Hispanic children and young, urban, middle-class Caucasian children, the dependent variable is a. Hispanic. b. psychomotor skills. c. urban. d. middle class. Researchers seek approval from the IRB prior to a. generating hypothesis. b. collecting research data. c. developing a research plan. d. conducting a literature review. The Federal Act that protects privacy of educational records is referred to as the a. National Family Rights and Privacy Act. b. National Family Research Act. c. Family Educational Rights and Privacy Act. d. National Research Act. 45. Jackie is conducting a study at the local skate park on youth’s use of slang language. She is unsure if she needs to submit her research to the IRB and asks for your opinion. How would you respond? a. She does not need IRB permission because of anonymity. b. She needs IRB permission because of personal privacy. c. She does not need IRB permission because she is observing only. d. She does not need IRB permission because there is no deception. Which of the following illustrates anonymity? a. After interviewing participants, the researcher assigns each participant pseudonyms. b. Although she can identify responses on the attitude measure by their handwriting, Kate does not report the names. c. Kristi replaces the participants’ names on their research materials with a random number. d. Because Kelly does not know who participated in her study, she cannot report their names. 47. Genna has told parents that their children’s responses to a spatial ability measure that she used in research will not be reported in the research report. However, she intends to report the data. This ethical concern relates to a. anonymity. b. confidentiality. c. debriefing. d. deception. 48. One of the reasons why ethical concerns for qualitative researchers are enhanced is because a. the researcher is engaged in the research context. b. the research generally addresses sensitive topics. c. qualitative researchers do not obtain informed consent. d. qualitative researchers generally employ deception. Of the following, informed consent accurately refers to a a. minor child participant’s agreement to participate in a study knowing the true nature of the study. b. parent’s legal permission for their children to participate in a study knowing the true nature of the study. c. a school’s formal agreement to allow researchers to conduct work in their school knowing the true nature of the study. d. a teacher’s formal permission to allow researchers in his or her classroom knowing the true nature of the study. d. No, it is always unethical for students to participate in studies for extra credit. 57. The philosophical assumption that addresses the nature of reality is referred to as a. epistemology. b. phenomenology. c. ontology. d. methodology. Chapter 2 Test Items 1. According to your text the first step in applying the scientific method is a. searching the existing literature. b. generating and testing a hypothesis. c. selecting and defining a research problem. d. drawing conclusions from data. One drawback of initial research problems is that they are often a. not relevant. b. too broad. c. too narrow. d. not ethical. Chyna is conducting a study with college students reading science texts that explores the role of interest apart from knowledge as articulated in Patricia Alexander’s Model of Domain Learning. Chyna’s research problem is best described as a study that a. tests theory. b. is a replication. c. is developed from a library search. d. comes from personal experiences. 4. Jill is a history teacher interested in whether differences exist in motivation to study history between students who are taught concepts sequentially through time and those who are taught concepts by geographic region. Jill’s research problem is best described as a study that a. tests theory. b. is a replication. c. is developed thorough library search. d. comes from personal experiences. 5. Jack just read an interesting study regarding middle school children’s use of computeranimated simulations to learn introductory chemistry. Although he is a physics professor he wants to see if the benefits of simulations are also found in college physics learners. Jack’s research topic is best described as a study that a. tests theory. b. is a replication. c. is developed thorough library search. d. comes from personal experiences. 6. The first step in selecting a research problem is a. going to the library and searching. b. asking an authority for opinion. c. selecting a problem related to your interest and expertise. d. reading theories and determining which to examine further. An organized body of concepts, generalizations, and principles defines a. a theory. b. a hypothesis. c. an experiment. d. a model. Based upon your textbookâ&#x20AC;&#x2122;s discussion, overview sources, such as handbooks in a particular area of research can best assist you in a. selecting a topic you will consider for further study. b. narrowing a topic you are considering for further research. 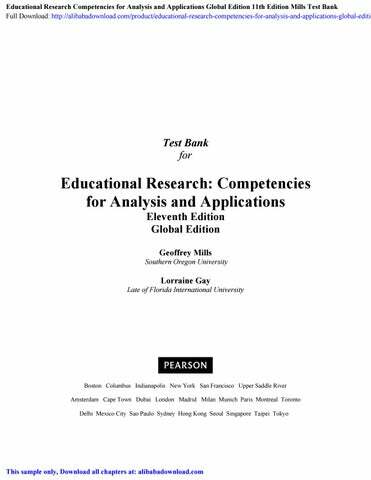 c. developing a theoretical basis for a study you have conducted. d. determining the best methodology for a study you have designed. Which of the following is the best example of a researchable problem? a. Should children who are in the primary grades be allowed to walk to school? b. Are children in the primary grades best taught to read by home-based experiences c. Are there differences in the amount of time spent reading in classrooms of non-native speakers? d. Should teachers hold parent teacher conference? Which of the following is an example of a researchable problem? a. Should homeschoolers include their children in cooperative schools for high school level courses? b. Are homeschooled students happier than are students in traditional schools? c. Should homeschooled students be included in our districtâ&#x20AC;&#x2122;s prom planning committee? d. Are there differences in achievement test scores between those homeschooled for part of the day or not at all in a certain school district? The following are characteristic of a good research problem EXCEPT a. The problem has theoretical or practical significance. b. The problemcan be investigated through the collection and analysis of data. c. The problemcan be investigated within a set period of time. d. The problemis investigates what individuals should do. 12. Sarah is really excited about her research problem. There are many homeschoolers in her state, and she wants to research if homeschoolers should hire professional educators to assist them with curriculum development. Of the following, which is the most important concern with Sarahâ&#x20AC;&#x2122;s research problem as currently developed? a. It is not researchable. b. It is not ethical. c. It is not of interest to Sarah. d. It is not relevant to educational theory or practice. Of the following, which is a quantitative research problem? a. The purpose of this study is to explore the experiences of first year principals. b. This study describes the decision making process of school board members during redistricting. c. The goals of this study are to report what nurse practitioner-teachers should do to prepare today’s nurses. d. This study tests the effects of a new alternative education program on students’ selfesteem. Of the following, which is a quantitative research problem? a. The purpose of this study is to examine how teacher’s should help students during office hours. b. The purpose of the study is to explore the experiences of students who seek help from faculty during office hours. c. The purpose of this study is to compare the grades of students who go to office hours and those who do not. d. The purpose of this study is to suggest how many office hours faculty should hold each week. Of the following, which is a quantitative research problem? a. The purpose of the study is to study the characteristics of female students in advanced mathematics courses. b. The purpose of this study is to examine relationships between future career goals and enrollment in advanced mathematics courses. c. This study examines what teachers should do to enroll more female students in advanced mathematics courses. d. The goals of this research were to describe two female students’ experiences in advanced mathematics. Of the following which is NOT a characteristic of a good hypothesis statement? a. It is testable within a reasonable time frame. b. It is supported by everyday experiences and intuition. c. It provides a reasonable explanation for the predicted outcome. d. It clearly states the expected relationship between the defined variables. 19. Identify the independent variable in the following hypothesis:Children who are given a free breakfast at school perform better on achievement tests and are more motivated for school than are those children who are not given breakfast. a. Achievement tests b. Free breakfast c. Children d. Motivation 20. Read the following hypothesis: Middle school students in an urban school who are trained in discussion techniques perform better on written tests of persuasive essays than those students who are not trained in discussion techniques.The independent variable in the stated hypothesis is: a. urban school. b. training in discussion techniques. c. persuasive essay tests. d. middle school students. 21. Pedro studies inclusion. He needs to generate a directional hypothesis for his study. Which of the following is an appropriate research hypothesis for Pedro. a. Children who are fully included do not learn in school. b. There are no differences in student learning between children who are fully included and those who are not. c. There are differences in learning between children who are fully included and those who are not. d. Children who are fully included learn more than children who are not fully included. 22. Which of the following is a non-directional hypothesis? a. There are no differences in motivation between students who are given a free breakfast at school and those students who are not given breakfast at school. b. There are differences in motivation between students who are given a free breakfast at school and those students who are not given breakfast at school. c. Children given breakfast at school are more motivated than children who are not given breakfast at school. d. Children given breakfast at school are less motivated than children who are not given breakfast at school. 25. Which of the following is a null hypothesis for the research question:Are there differences in final class grades between students who are taught psychology in a lecture format or self-paced? a. There are differences in final class grade between students taught psychology in lecture versus self-paced format. b. There are no differences in final class grade between students taught psychology in lecture versus self-paced format. c. Students taught psychology in lecture format receive higher class grades than those in self-paced conditions. d. Students in self-paced conditions have higher class grades in psychology than those in lecture classes. 26. Which of the following is a nondirectional hypothesis for the research question, Are there differences in end of course biology test grades between those who use simulated labs and those who use traditional labs? a. There are differences in end of course biology test grades between those taught through the use of simulated versus traditional labs. b. There are no differences in end of course biology test grades between those taught through the use of simulated versus traditional labs. c. Those taught in simulated labs perform better on end of course biology tests than those taught in traditional labs. d. Those taught in traditional labs perform better on end of course biology tests than those in simulated labs. 27. Of the following, which is most likely addressed as a quantitative research problem? a. The purpose of the study is to examine the relationship between IQ score and Postgraduate GPA. b. The purpose of the study is to describe the typical day of a high school history teacher. c. The current study shares a summary of the coping strategies used by a n ADHD student in an inclusion classroom. d. This work shares the history of the events that led to consolidation of two local rural high schools. a. b. c. d. 30. The study is too broad. The study is not ethical. The study is not relevant. The study is too narrow. Which of the following is an example of a researchable problem? a. Should we teach children formal reading skills before they enter school? b. Is there a relationship between SES and children’s amount of reading in the home? c. Are high school students best served by taking numerous electives or a core curriculum? d. Should all children be exposed to exercise at school daily? 31. Candace is conducting a research study and is having trouble with her variable ‘selfconcept’ she decides to define self-concept as one’s beliefs about one’s capabilities in a given domain. She will measure it using a common Likert-type scale. Candace is engaging in which of the following research tasks? a. Generating hypothesis b. Operationalizing variables c. Defining a sample d. Interpreting findings 32. Of the following, which is the best example of a qualitative research problem? a. The purpose of the study is to assess learning gains in students enrolled in a summer reading program. b. This work addresses gender differences in spatial reasoning. c. This study extends previous research on relations between student’s decision-making and creativity. d. The goal of this study is to describe experiences of transgendered adolescents.